What is the story, after the story? Even the most ambitious drama can only give us glimpses and snatches of a life, key moments distilled. 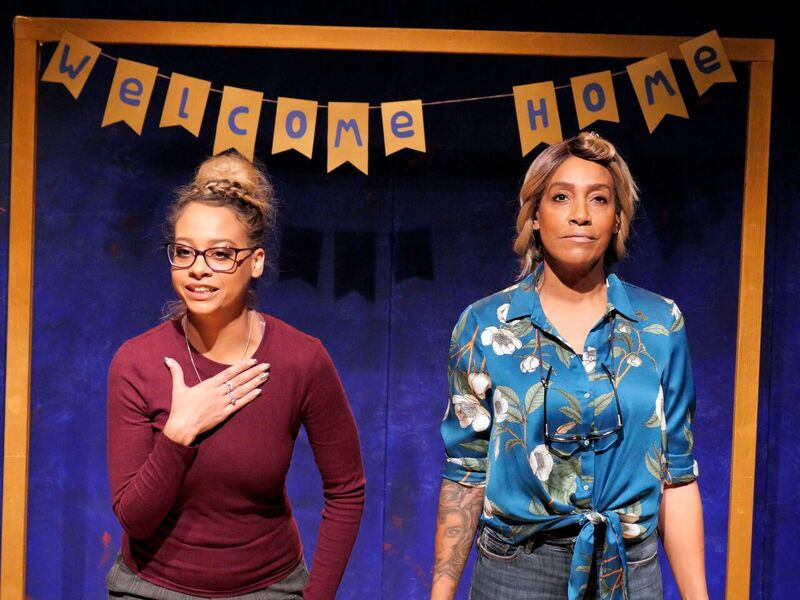 Open Clasp’s don’t forget the birds takes up where its previous production Key Change ended: what happens to the women in your prison play after they get out? Cheryl Byron was one of the original collaborators on that show. …birds tells the story of her release from prison and its aftermath – her struggle not only to reintegrate herself in the life she left behind, but, crucially, to reconnect with her daughter, Abigail. This was always a piece that was going to hit me where I lived. A story about working class women, about mothers and daughters, told in an accent I might have (mostly) trained myself out of, but is the one I slip back into, the voice of my home and my youth. Cheryl, with her humour and a temper that flares quickly when she thinks she is being patronised by anyone in authority (not to mention her disgust at sloppy housekeeping), could have been any one of a dozen women I grew up surrounded by. But even if it isn’t tailor-made to your particular sweet spots, don’t forget the birds is an utter joy. Performed with enormous charm by the two women, and with a chemistry that can’t be faked, it crams a lot into a fast-moving hour. Its focus is their relationship – so close before Cheryl was incarcerated, so altered by her absence – but it also unpicks the reasons she ended up in prison, the hundred different complications of being out. It covers their complex family dynamics, Cheryl’s history of domestic abuse and drug taking, what it’s like to be a black / biracial family in a white neighbourhood (in a city that’s even now still pretty white), the role reversal when a fairly spoiled child finds herself having to parent her mother – and it does so with plenty of humour and clear-eyed precision, without the merest hint of self-pity. Impressively, it also manages to pack a lot of nuance into such a compact piece. How a man might be a great father in the eyes of his children but revealed as a terrible husband, his memory a source of both pride and shame; how losing your mother to captivity might kick start your own, unlooked-for independence; how prison might be dehumanising in all its petty tyrannies, but also might be the very thing that saves you. It would be easy to make a bleak drama out of such a story, or craft it into some trite tale of redemption. But …birds embraces its complications, its hesitations, the stuttering steps as the two women circle each other, trying to find their way back to a dance they both used to know. (Sometimes literally – praise must be given to movement director Mona McCarthy for a show that feels at times as deftly choreographed as a ballet). Verity Quinn’s set is an explosion of roses, defiant in its conspicuous beauty, a suitable backdrop to a story packed with warmth and heart. There’s a hunger for ‘real’ people’s stories in theatre, and that can be both a good and a bad thing. Such productions can be a way of empowering individuals to share their truth, or an excuse to wring dry the lives of working class, black or brown people so a middle class audience gets to feel momentarily woke. It’s to Open Clasp’s credit that …birds never feels like that. Writer Catrina McHugh and director Laura Lindow worked with the Byrons on developing this production, and it shows: there’s not a hint of cheap voyeurism about the piece, no gawping from the sidelines, not a single moment of unintended laughter. In great part this is down to the two women at the heart of it. They are very different – Cheryl a mix of strutting charisma and touching vulnerability, Abigail more introspective and considered – but they completely own the stage, and we laugh or cry at their behest, joining in because we’re invited. “This is our story,” they tell us, at the end, and the best thing about this show is that we believe them. don’t forget the birds runs at Live Theatre, Newcastle, until 24 November, then at Battersea Arts Centre until 1 December. More info here.